“I was uplifted into huge regions of northern sky. I desired with almost sickening intensity something never to be described (except that it is cold, spacious, severe, pale and remote) and then … found myself at the very same moment already falling out of that desire and wishing I were back in it.” Qu0te from C.S Lewis. 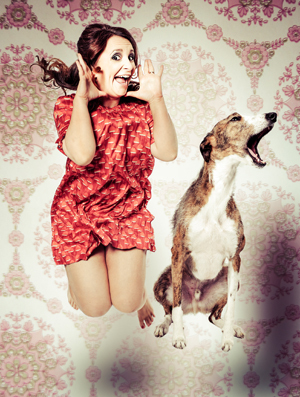 Lucy Porter – doing stand up in the Down Arts Centre. Comedy favourite Lucy Porter brings her new stand up show ‘Northern Soul’ on tour and will be at the Down Arts Centre on Friday 16 May. Does geography shape your destiny? Fringe favourite Lucy Porter’s latest (and greatest) show is about never quite knowing where you belong. Born in Croydon to a Northern Irish dad and a Mid-lander mum (who met in Africa), Lucy never felt comfortable as a South London suburbanite. In her teenage years she was seduced by the music of Morrissey, the art of David Hockney and the politics of Dennis Skinner. Then she was seduced by the kissing of an actual man from Bury, and she started to suspect that the North of England might be her spiritual home. Lucy moved to Manchester and then Liverpool. As much as she loved her time there, she didn’t find the sense of completion she’d yearned for. Stand-up comedy has allowed Lucy to travel the world, and she’s acquired a taste for the exotic (she even married a Welshman) but she’s still – like the Littlest Hobo – waiting to find a place to settle down. Currently living in London, Lucy still finds that her internal compass points North, but now she suspects it might be a symptom of the profound, insatiable longing that CS Lewis describes as ‘The Northernness’. A momentary epiphany made Lucy think she’d found an answer to this emptiness in Norwich but she now realizes that was a side-effect of sloe gin. Like any good Northern Soul night, Lucy’s show should leave you feeling happy and slightly sweaty. In other news, Radio 4 have commissioned a script for a sketch show that Lucy is writing with Catherine Shepherd, and she is also at full pelt creating a sitcom with the working title “Giant Husband, Tiny Wife”. They say that everyone has a book in them, and Lucy has been involved in the painful process of extracting hers for some years now. She now has a literary agenthelping her, and we hope to hear the pitter patter of tiny pages very soon. Lucy can currently be heard on Radio 4 shows including ‘The Unbelievable Truth’ and ‘Jo Caulfield’s Speakeasy’. A veteran ‘talking head’, the eclectic mix of topics she has discussed or paid tribute to on BBC2, ITV, Radio 4 and Sky Arts include: The Bradshaws, Clive Dunne, Now That’s What I Call Music, Mark E Smith, Coventry and the colour green. Lucy is the voice of Playstation’s online magazine ‘Access’, and consequently gets quite a few 15-year-olds turning up to her shows expecting her to talk about ‘God of War’ and ‘Skyrim’. After a few years of enforced absence, Lucy roared back to the Fringe in 2012 with her critically acclaimed show ‘People Person’ which she subsequently took on a 42 date tour of arts centres & theatres in 2013. People Person will be released on DVD by Go Faster Stripe in 2013. ‘….She is like your witty friend who’s always brilliant company down the pub. Many stand-ups would give their non-drinking arms to be able to transfer that kind of sparkling barroom bonhomie to the stage and Porter does it effortlessly’ – THE SCOTSMAN.